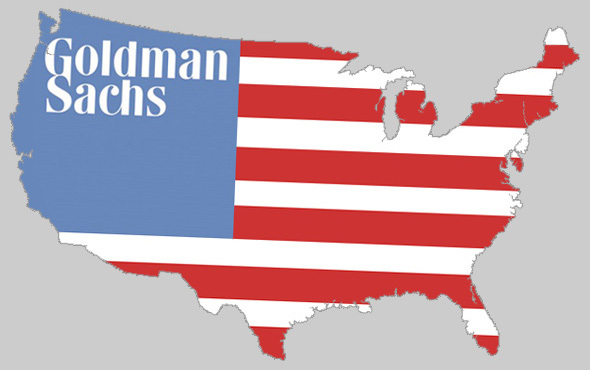 Is Goldman Sachs the Face of Capitalism? Goldman Sachs is the smartest, toughest, most aggressive, most powerful player in the world: They have the most powerful political connections. They have the most competitive culture. They make the most money. They win more than almost anybody else. They are the biggest dog in the world. In other words, you could think about Goldman Sachs the way most of the world thinks of the United States. Goldman Sachs is the smartest, toughest, most aggressive, most powerful player in the world. Period. They have the most powerful political connections. They get the smartest people to work for them. They have the most competitive culture. They make the most money. They win more than they lose, and they win more than almost anybody else. The way they play the game makes them the biggest dog in the world. In other words, you could think about Goldman Sachs the way most of the world thinks of the United States of America. Not fair! The United States of America is the most generous nation in the world. We contribute to the rest of the world. We provide aid to needy nations. We not only are powerful, we are also . . . good. Which is what the defenders of Goldman Sachs say. Goldman uses its power and money for good. Yes, it rewards itself with fat bonuses. But there’s also the generous side of Goldman. The philanthropic side of Goldman. The noblesse oblige side of Goldman. The reaction to Goldman today in the press is one of the things that happens when Americans see too clearly their reflection in a mirror. Are we really that aggressive? Do we really play the game with that degree of cut-throat, win-at-all-costs raw power? Is that really the face of capitalism? The answer to those questions is to ask some more questions, to use this face-in-the-mirror moment to do some long-overdue soul searching. If you owned stock in Goldman Sachs, would you sell it? Or buy more? Would you write an angry letter as a shareholder? Or secretly congratulate management for maximizing shareholder value–and hope the SEC case falls apart? If your son or daughter were about to be awarded his or her MBA, and Goldman produced an offer letter, inviting him or her to join the firm, would you argue against taking the offer? Or offer your own congratulations on the invitation to join the inner circle of the world’s financial elite? Here’s the question behind the question: What kind of capitalism do Americans really want? Casino capitalism? Wild West capitalism? Winner-take-all capitalism? Or are we looking for something that moderates raw, unfettered, ruthless cowboy capitalism with values that include social equity, the public good, the common cause? It’s not simply a matter of more-or-less government regulation, although regulation is one tool for braking the otherwise foot-to-the-floor style of Goldman and others. It’s a matter of national values, national purpose, and social philosophy. Adam Smith wrote The Theory of Moral Sentiments to make the point that in matters of economics and social well-being we all have a responsibility to each other. He wrote The Wealth of Nations to describe the operations of the invisible hand to maximize the efficiency of economic transactions. When we look in the mirror after the dust settles over financial regulation, which face of capitalism do we want to see? What do we want our champions of finance to represent? Because what we are is what we get. We are all Goldman Sachs. This article first appeared in the Washington Post‘s On Leadership section. Alan Webber, a founding editor of Fast Company magazine, is an award-winning editor, author, and columnist. His most recent book is Rules of Thumb: 52 Truths for Winning at Business Without Losing Yourself.